Message: Access to the registry key is denied. I was not able to register it as it did not allow me to get that far. Installed NOT on OS drive as recommended, please advise. Tried to install on VISTA ULTIMATE x32 and i get this error. Have you tried a search on the error in this forum (like the poster above you)?? This has been asked, answered and fixed previously. Let us know if your error is different. 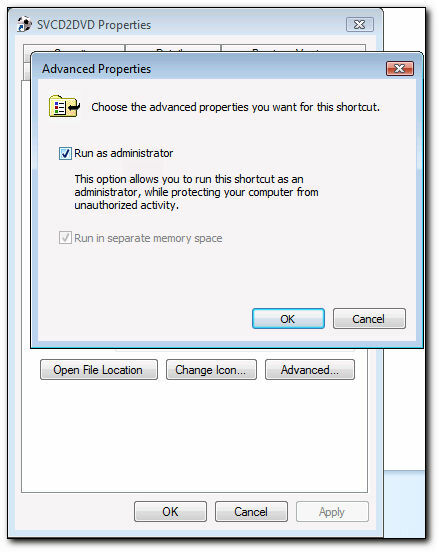 Go the the actual exe file (SVCD2DVD.exe) and do Right Click-> "Run as administrator"
In both cases you will be able to get past this error. It is also recommended that (with this version of S2D & Vista) you install in a folder other than "Program Files"
SVCD2DVD v2.5, AVI/MPEG/HDTV/AviSynth/h264->DVD, PAL->NTSC conversion. VOB2MPG PRO, Extract mpegs from your DVDs - with you in control! That's it ChrissyBoy you were 100% correct with your reply, i just located the .exe file in program files where it was installed as default, right clicked it and selected run as administrator and BINGO! it worked a treat. Bye the way any new developments for this fab prog or a banner change to 2007? I had a different error when trying to register in Vista - "Internal Error - contact the author" (or something remarkably similar). 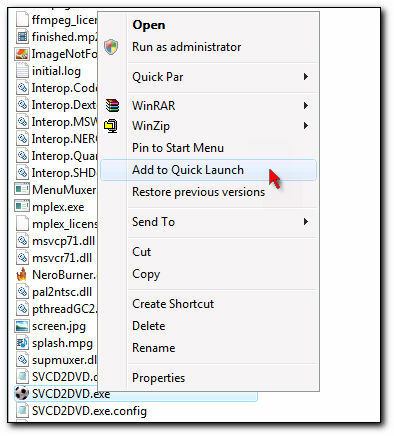 IF you want SVCD2DVD on your Start menu use the "Pin to start menu" option (not make shortcut) and then you can right-click it and run as administrator from there. I can't praise this software enough, Chrissyboy's dedication to his creation makes it more than worth the investment. I am constantly recommending that people BUY this software as it is such good value and IMHO the best piece of software by far for quick, easy conversions. Once again - thank you, Chrissyboy! there is an error registering the program. error, it is because the SVCD2DVD.exe file is in use. If you do a quick reboot and try again you should be ok.
Oh yes, 2-pass encoding is great... any chance of 4- or 6-pass encoding in the future? My problem was a little different and I rebooted 3 times but still couldn't get it to register! Reinstalled it to another folder and it worked perfectly first attempt. For some reason it wouldn't register whilst it was living in C:\Program Files. Oh no, I shouldn't have asked! Now I am drooling at the thought - any more details? I've often dreamt of finding the perfect piece of software... powerful AND easy to use. Installed latest version of SVCD2DVD 2.5.3000. Installed as Admin. Stopped with "Program has stopped working and will be closed etc.. Error. Running Vista Premium 64 bit. Took me 2 days to figure it out, was because I had UAC turned off. Turned it back on and now everything is peachy, except of course I got the UAC crap again. Anyone know a way around this? Turning it on and off isn't a good workaround as it requires a reboot each time. Not a problem only with 2.5.3000 as I reinstalled a couple of older versions and they exhibit the same begaviour. Top proggy BTW Chrissy Boy, been using it for several years now and would be lost without it. Ok - it is to do with WMP.... What version are you running? 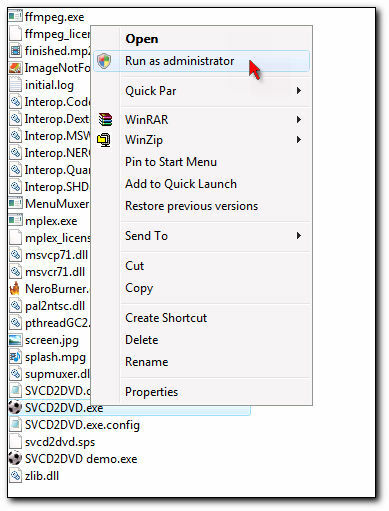 Didn't the Vista install problem really start when Vista got installed? Click "OK" to all the dialog boxes and you should be good to go! 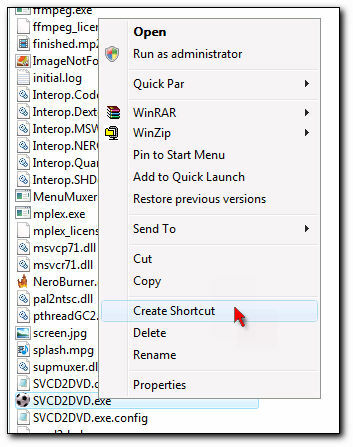 Use the shortcut to run the program and so you will be always be running as administrator. Message: Access to the path 'C:\Users\Private\Desktop\Newsgroup\10,000_BC_(200 8)\bald-bc\SVCD2DVD_OUTPUT\VIDEO_TS\VTS_01_2.VOB' is denied. Very nice program eventhough restricted to Administrators, but I can live with that (if not my wife lol!). Thanks for a great effort Chrissyboy. I have been using it for almost half a year now and suddenly it stopped. It just shows the splash screen and "boink" just disappears. Can this behaviour be anything to do with Vista SP1? I tried a repair of the install to no avail. Any help appreciated. can you please help, tried everything now to get my svcd2dvd working on windows 7, I had vista installed and everything was fine, I then purchased a copy of windows 7 and upgraded my system, it still worked fine after upgrading until yesterday, I did a system restore and now whatever I do I cannot get it working again, any help would be appreciated. Did you try a reinstall of SVCD2DVD?